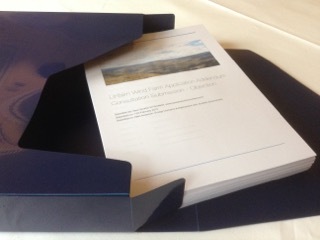 Here is our complete document which comprises our lengthy and detailed response to the Linfairn Wind Farm Addendum. We have uploaded them as individual chapters to allow readers to look at those which are of particular interest to them without having to download a large file. We do hope you will read as many chapters as possible though! There are 17 Chapters which correspond to the Addendum although we have added subsections to Chapter 6 as we feel they failed to properly address the effects of all the impacts including Cumulative, Residential Amenity and Wild Land in their proposal. I refer to the maps relating to the 2km visibility…what a load of rubbish. Do they mean over 2km they can’t be seen. Well I will clearly see all the turbines from anywhere on my property. At the moment even on a calm day with a slightly easterly wind I can clearly hear the cows mooing on the site where these turbines are to be. So hell knows what it will be like when these blades are going around..??? As above..ALL turbines will be clearly visible from ALL my front widows and my garden. as to noise I can hear the Girvan-Stranraer train on a clear calm day!